ENO Pak Pillow. For the nomad who thrives for freedom. From start to finish, through any journey on life's path, the comfort of home will be on your mind. The dual sided Pakpillow compact travel pillow offers your face climate control. For hot trails, flip it to the breathable micro fiber side. For cold climates, flip it to the polar fleece side. When you awake, simply turn your Pakpillow pillow outside-in into it's own internal stuff sack to keep it clean and compact. 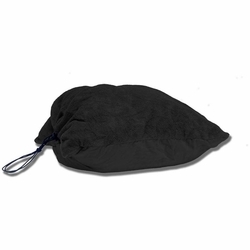 The stuff sack allows loft adjustment by inserting clothes or even valuables inside. Tighten the compression strap and hook it on your pack. The Pakpillow is superior to any other travel pillow on the market by the function, weight, compactness and high quality fabric. Eagles Nest Outfitters. Dimensions: (L x W) 13" x 17"